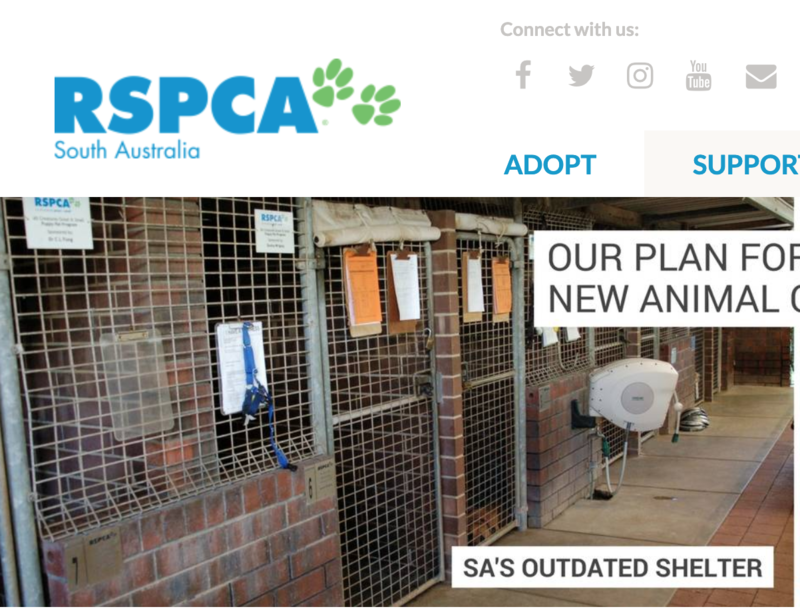 More than a year ago, back in February 2018, the RSPCA SA ran a major campaign to try and encourage the state government to contribute 4 hectares of land and $5 million dollars to a new shelter to replace the Lonsdale facility. ... our Lonsdale shelter is the most out-dated RSPCA facility of any of the major states, and is not suited for redevelopment. We must create a modern hub for animal welfare, where we educate, engage and empower South Australians in best practice animal care. "The problem that we've got is that Lonsdale is just so old now. It was built forty-odd years ago, and the facilities were designed using animal behaviour and animal science which is half a century old... really the facilities are that we can't offer best practice animal care. At the end of the day (pets) are just so much better off out in the community, living in people's homes, rather than being concentrated in a shelter environment; in cages, smelling, hearing, seeing all the other animals which gives them stress. It's a really important part of our plans in future, is that we want to have more animals, just sitting in people's homes, just getting individual care, until they're ready to come in and go through our adoption process." "Major change is also required in our animal shelters. With exponential advances in animal science since its construction in 1979, the design of the Lonsdale animal care facilities are becoming obsolete and amongst the most dated in Australia. Despite the committed work of our staff and volunteers, poor design can result in sub-optimal welfare outcomes for animals. " So of course, being aware of these issues, the RSPCA SA stopped taking dogs into their facilities for long-term stays because making them more sick - harming dogs - that's bad, right. Just kidding! They took 10 institutionalised border collies into their craptastic kennels, left them there for five months, and then assessed all of them as unsuitable to be rehomed. Since taking ownership of the ten dogs this past Friday, the RSPCA SA has killed four of them. Community rescue groups have stepped in. Aware that any further dogs seized by the RSPCA from this property would at significant mortal risk, rescue groups went to the puppy farmers premises and took a large number of these dogs and placed them with foster carers. You know, the kind that the RSPCA SA speak so highly of. And those dogs are doing really, really well. ‍thanks rescue groups! for saving the lives of the remaining dogs so that they didn't have to spend time in the RSPCA SA's doggy Alcatraz, putting their lives in immediate danger too. Just kidding (again!). That was never going to happen because as we know - that's just not how the RSPCA rolls. Instead the RSPCA SA released a public statement defending their right to kill these dogs, and took the time to condemn the rescue groups who took the other animals, as helping out the puppy farmers. RSPCA inspectors seized 10 adult dogs from the property – those considered to be in the worst condition, exhibiting the most chronic behavioural issues and mental suffering. Some of these dogs were pregnant and later had puppies while in RSPCA care. For the past five months, the seized dogs have received ongoing attention from our 13-member veterinary team, along with extensive behavioural monitoring and modification training from qualified animal behaviourists at our Lonsdale animal care centre. Our staff have also been looking for any small indication that these adult dogs are capable of trusting and relating to humans. To help animals transition to life as family pets, we do put them into foster care whenever possible, until they are adopted. Sadly, while foster care has been possible for most of the puppies, it has not been possible for the adult dogs due to their chronic anxiety and unpredictable behaviour. We already have very experienced foster carers who could be called upon if the dogs were capable of benefitting from housing in a domestic environment, and were safe to do so. Unfortunately neither is the case. The dogs’ behaviour indicates that they’ve had little or no experience of life outside a cage. Hence, they have likely never enjoyed the usual human interaction and socialisation received by family pets. The professional advice RSPCA has received to date indicates it would be highly irresponsible and inhumane to place these dogs into foster care or make them available for adoption. The dogs have "chronic anxiety" and have "no experience of life outside a cage" and so as a treatment plan the RSPCA SA left them in a different cage for five months, then deemed that rather than try to allow them some "usual human interaction" at least four of these dogs have now been killed. RSPCA urges people to question the true motives of individuals who have purported to be trying to act in the dogs’ best interests, given their ongoing determination to publish incorrect information and evidence of alignment with the defendants. RSPCA continues to have serious concerns about the welfare of all dogs that lived at the defendants’ property. If successful in the prosecution of this case RSPCA will seek court ordered custody of any animals remaining at the breeding facility. RSPCA believes the remaining animals are capable of rehabilitation and safe rehoming in the community. Due to the large number of dogs likely to be involved, RSPCA may seek the assistance of responsible rescue groups with that process. Nothing screams 'we want to work with rescue' like the RSPCA SA running down the reputations of the same rescue groups who were outraged enough at the planned 100% kill rate to step in and save the remaining dogs from being seized and killed by the RSPCA SA. It must be remembered that these 10 border collies were seized because they were assessed as experiencing the worst mental suffering of the 300 dogs on the property. And this must be the most bonkers assertion of all. How does one exactly, assess a dog in a cage as being more or less psychologically redeemable than another dog in a cage before getting those dogs out of the cages and into actual homes? These 'in-cage assessments' - just how scientific are they? *spoiler alert; not scientific at all. The RSPCA SA should take absolutely no future seized dogs who have owners with court cases or prosecutions into their facilities. Putting dogs into poor facilities, known to get poor results, and then blaming the dogs for the poor results is a systemic failure. It can't change - won't change. We'd serve the pets well to stop using the broken system. The RSPCA SA acknowledge that their facilities make animals sicker than when they arrived. That their facilities are, according to their own CEO, are "not best practice" and achieve "sub-optimal welfare outcomes" for animals. Court cases are known to regularly drag on for months and years. The RSPCA SA should observe its own mandate to prevent further cruelty to animals by subjecting them to a stay in the Lonsdale shelter. Once a dog is rescued and taken into protective care from former abusers, we must work to avoid allowing damaged animals to become victims yet again by killing them. The RSPCA SA should close its facility to the animals of prosecution cases immediately.